In Ohio, Help Me Grow (HMG) is the statewide, family-centered, coordinated system serving children birth to three years of age who have or are at risk for developmental delays. Any family, regardless of income level, with a concern about the development of their infant or toddler is entitled to an evaluation and assessment to determine eligibility. If a child, under the age of three, has a specified developmental delay or medical condition likely to result in a delay, s/he is eligible for HMG services. To support families in their natural care-giving and nurturing roles, HMG brings together the parents and health, education, and social service professionals. This team writes an Individualized Family Service Plan (IFSP) based on the family's priorities and the child's developmental needs. The IFSP becomes the road map for the services the family and their young child will receive. Information about Ohio's Help Me Grow Program is available at www.ohiohelpmegrow.org. Easter Seals has, for more than 90 years provided services to children and adults with disabilities and special needs, and their families. Easter Seals provides exceptional services for people with disabilities or special needs and their families to live, learn, work and play in their communities. The Down Syndrome Association of Central Ohio (DSACO) is the leading source information, support and referral assistance to families throughout 16 central Ohio counties. Our mission is to support families, promote community involvement and encourage a lifetime of opportunities for people with Down syndrome. 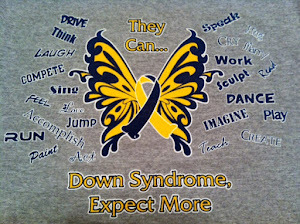 Our vision is for people with Down syndrome to achieve their fullest potential in an accepting and inclusive community. Get involved and do your part to show the world we are more alike than different! Mission: To empower individuals, educate families, enhance communities and together, celebrate the extraordinary lives of people with Down syndrome. To provide support, advocacy, resources, education and opportunity for those with Down syndrome and their families. The mission of the Down Syndrome Support Network is to provide support, advocacy, education, and resources that will empower families and persons with Down syndrome; to link families with agencies and services, both locally and nationally, that will enable families to provide the best care, early intervention and education to their child. MVDSA was established in 1977 as a non-profit organization of families and professionals working together to improve the quality of life for persons with Down syndrome and their families throughout the greater Miami Valley. To offer encouragement to new and expectant parents through education, loving support, and hope for the future. To provide families, friends and people touched by Down syndrome information, support, and friendship. To further education and awareness of the benefits for inclusion of persons affected by Down syndrome in our society. They invite you to connect with our on-line family support network, to join us at one of our many programs, do research in our comprehensive resource directory, or enjoy the photos in our photogallery and so much more. The Arc of Ohio is a statewide membership association made up of people with intellectual and developmental disabilities, their families, friends, interested citizens and professionals in the disability field. Together with our individual members and local chapters, we represent more than 330,000 Ohioans with intellectual and developmental disabilities and their families.